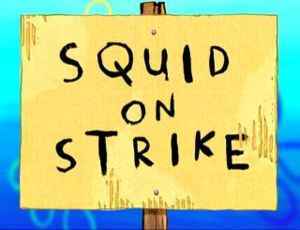 Squid on Strike (Episode) – From SpongePedia, the biggest SpongeBob-wiki in the world! SpongeBob misses the Krusty Krab after getting fired. Mr. Krabs is reviewing charts based on Krusty Krab income when he sees that profit is down by $3. He proceeds to charge his employees fees for doing certain things like standing. Squidward finds this completely outrageous and convinces SpongeBob to go on strike with him. However SpongeBob doesn't know what a strike is and becomes heartbroken when they get fired. They continue to strike but SpongeBob's incompetence and misunderstanding of Squidward's instructions only makes the restaurant more popular. After many of these incidences, teens take their jobs, but they won't leave Mr. Krabs alone, driving him to miss SpongeBob and Squidward. In addition to this, SpongeBob says that he and Squidward will stay on strike forever, a thought which gives Squidward a nightmare causing him to run to Mr. Krabs' house to beg for their jobs back. 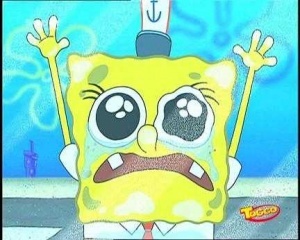 When he gets there, to his surprise Mr. Krabs begs him and SpongeBob to come back. They make a deal so that Squidward and SpongeBob can get their jobs back. Meanwhile, SpongeBob does not know about this, so he wrecks the Krusty Krab. When Squidward and Mr. Krabs arrive and see the destroyed Krusty Krab, Mr. Krabs literally falls to pieces and orders Squidward and SpongeBob to work for him forever in order to pay off the damages. The music during the title card is from the song played later in the episode called "Hey Mean Mr. Bossman" by Sage Guyton. It is featured on the SpongeBob SquarePants CD, The Yellow Album. This page was last modified on 5 September 2010, at 16:46.